- Set of 2 plain white candle holders. These are about as "plain jane" as you can get— the perfect blank canvas. You can use these with any color of mini candle, and they are an appropriate, if utilitarian, backdrop to any ritual. They may not be anything special, but believe me, they'll come in handy, time after time. 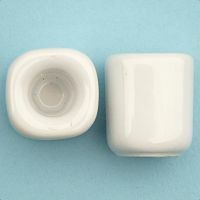 These white porcelain candle holders measure just over 1" tall. The opening is 1/2" in diameter, just right for our mini candles. My candles are wobbly when I use these holders. What should I do? 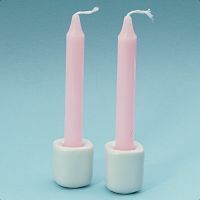 Usually this isn't a problem, but if you are having trouble getting your candles to stand straight, try melting the bottom of the candle just slightly, and then quickly putting it into the holder. The melted wax will stick to the holder and provide the stability your candle needs. How can I clean the wax off of these? The easiest way is to peel off any wax while it is still warm. Just be careful not to burn yourself! If the wax has already cooled and hardened, you can soak the candle holders in hot water to soften it again. Alternately, you can place the candle holders in your freezer. Leave them in until they are thoroughly chilled, and the wax should pop off easily. 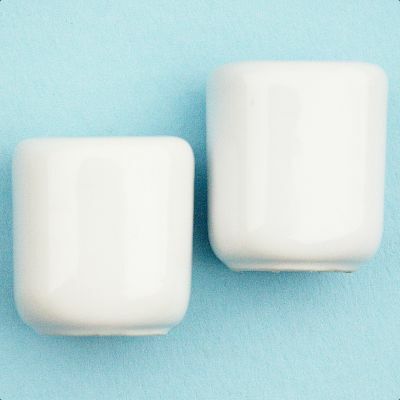 Do you have any other questions about our Pair of Plain White Mini Candle Holders? Nice little candle holders, good quality, great for a travel altar/shrine or for the pagan without much altar space, or for candle spellwork. I love these candle holders! they are the perfect size to be quietly stowed out of sight, but they really bring magic to any setting. These candle holders are a perfect fit for the small taper candles, and work very well in a temporary alter or any small space! !